The Exchange Invest 1000 is an index of the most influential people in the world’s market structure (exchanges, clearing houses et al). The Index uses a series of proprietary algorithms, devised by Index Compiler and Editor, Patrick L Young, a former exchange CEO and longstanding expert in the market structure field. 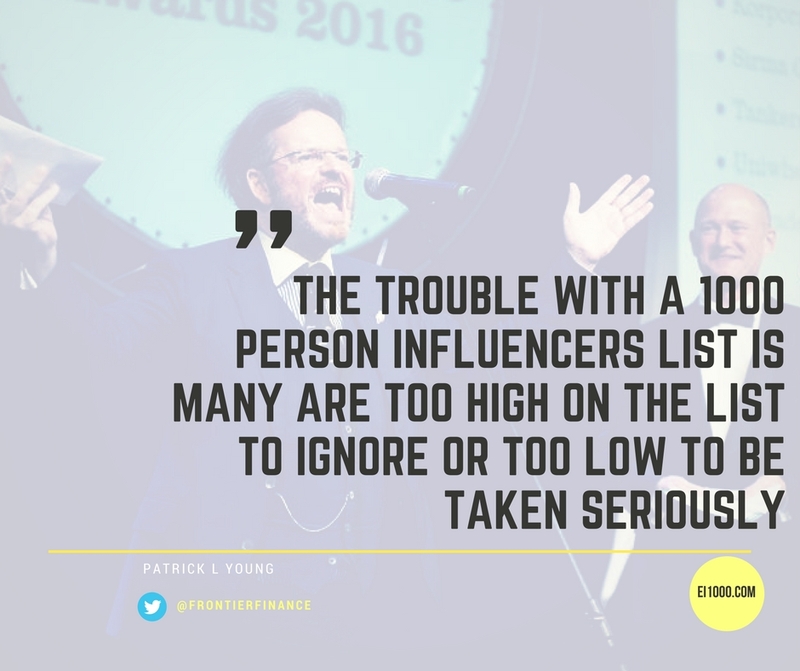 The EI1000 Index was created as a result of the popularity of the Exchange Invest Newsletter, created and curated by Patrick L Young which has become the world’s daily benchmark newsletter of market structures. 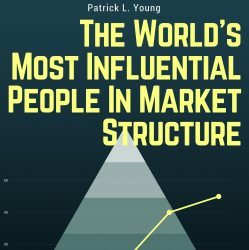 This is the First Volume of the Index which will become an annual publication and contains the full list of the 1000 leading figures in the world’s market structure in numerical order. There are also sections for people who have suffered Relegation from the index or those who have Resigned or Retired from the industry. A separate sectoin outlines those industry members who have passed away in recent times. The book includes some 30 sub lists ranging from the top 10 by different geographies, through leading women, and other topics such as “Dealmakers” “Visionaries” and those involved in “Blockchain” and “FinTech” etc. Exchange Invest is the daily newsletter about exchanges and market structure. It was created by Patrick L Young and is emailed daily (free of charge) to all the leading figures in the “parish” of market structure worldwide including the C-suites of exchange, CCPs, CSDs and related analysts, brokers, consultants, investors, journalists et al. Patrick L Young is a fintech pioneer (his first book “Capital Market Revolution!” (FT Prentice Hall 1999) was published a decade before the word “fintech” was first used!) and former exchange CEO who advises investors and market structure practitioners worldwide while building his next fintech project. 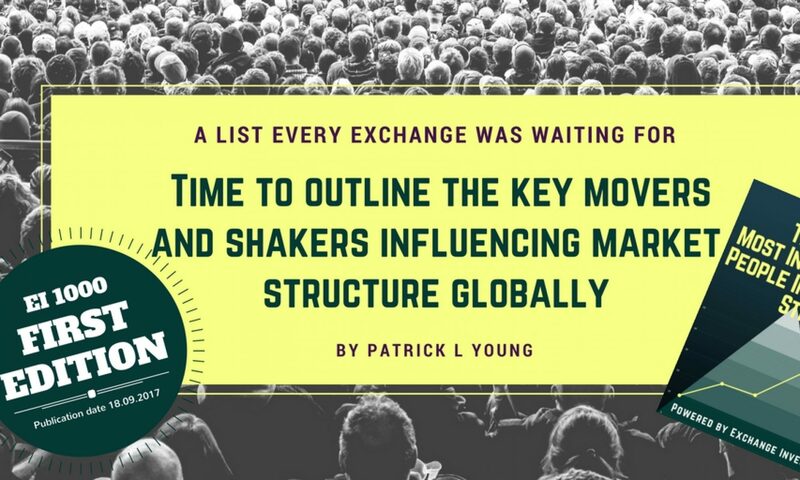 Patrick publishes the daily newsletter of financial market structure “Exchange Invest” and his opinion pieces have been published in many of the world’s leading business newspapers including AFR, Boersen Zeitung, FT and the Wall Street Journal amongst others. He has spoken at conferences worldwide and appeared on many tv and radio channels including BBC, Bloomberg TV, CBC, CCTV, CNBC, CNN, Reuters TV, RT and SBS.